Supposedly the world is supposed to end on October 21. So we can all be ready for this event, I wanted to share the knowledge I’ve learned from the three Mad Max films which showed me exactly what post-apocalyptic life will be like. 10. Wear leather. I’m not sure why this is necessary, but everyone wears leather in all of the films so it must have a purpose. Besides you look really cool. 9. Don’t talk much. In the post apocalyptic world, your enemies will most likely out-weigh your friends, so don’t talk much. In all of Mad Max 2: Road Warrior (1981) , Max only said 16 lines and was still alive by the end of the movie. 6. When running from maniacs on motorcycles, don’t run down the middle of the road. Max’s wife and child prove this in Mad Max (1979) that running down the middle of the road from crazed bikers only makes you an easier target. Though I’m not sure if running in the grass would’ve helped or not. 5. Only do favors in exchange for gas/petrol. “I only came for the gasoline” is said twice by Max (out of his 16 lines) in “Road Warrior.” When resources are slim, don’t do anything for free. 1. Avoid large groups of children who think you are a mythical spaceman savior. Things were going pretty well for Max until he was banished from civilization and found by a bunch of ‘lost boy’ like kids. They had water and fed him, but think he is a god who would take them to the pre-apocalyptic world. They also only get him into more trouble when they go out searching for this world and are discovered by…Tina Turner (Thunderdome). I hope this has thoroughly prepared you for the end of the world this week or in the next 500 years. 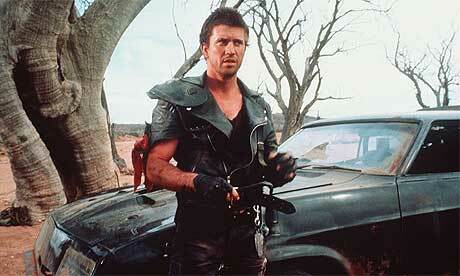 This entry was posted in Comet Archives and tagged Interceptor, Mad Max, Road Warrior, Thunderdome by Jnpickens. Bookmark the permalink. You’ve given me a good laugh! I’ve had my belly laugh for the day. Normally I try to avoid people with feral children, but it’s good to know they can come in handy in post-apocalyptic situations! haha I just try to stay away from children, but ones good with boomerangs are probably handy to have around.